Born in 1973 in Wisconsin, Seidel began his culinary career at 14, serving as sous chef at Racine’s Main Street Bistro by age 20. He attended culinary school at Western Culinary Institute in Portland, Oregon, finishing at the top of his class. After graduation, Seidel moved to California where he worked at Hubert Keller’s Club XIX at Pebble Beach Resort. He later became sous chef at Antoine Michelle, then chef de cuisine at Carmel Valley Ranch. During a trip to Colorado’s Vail Valley Alex fell in love with the mountains and soon found a home as chef de cuisine in one of Colorado’s most renowned restaurants, Sweet Basil. Chasing his first love and wife, Melissa, Seidel moved to Denver in 2002 and became executive chef at restaurateur Frank Bonanno’s fine-dining flagship, Mizuna. Seidel left Mizuna to launch his own restaurant, Fruition (fruitionrestaurant.com), which opened its doors on February 5, 2007 and remains one of Denver’s most coveted dinner reservations today. Upon opening, gayot.com named Fruition one of the top 10 new restaurants in the U.S.; Zagat soon rated Seidel’s spot the number one restaurant in Colorado, an honor it has held every year since opening; and 5280 magazine has included Fruition in its list of 25 Best Restaurants every year the ranking has run. Seidel himself has been the recipient of even more accolades, earning one of the most celebrated nods in the industry when Food & Wine magazine named him a Best New Chef in 2010. In addition, Denver Magazine called him Chef of the Year in 2009, 5280 gave him that title in 2008, and he has been a semi-finalist for the James Beard Foundation’s “Best Chef Southwest” honor numerous times. 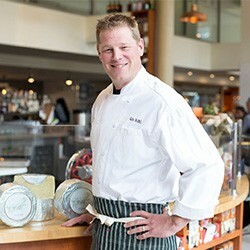 Seidel cooked at the 20th Anniversary of “Dinners Across America” and was an opening chef of Aspen’s Chefs Club by Food & Wine. When not cooking at Fruition, Seidel is at his farm tending or milking some 60 sheep. The ricotta from Fruition Farms Dairy (fruitionfarmsdairy.com) won a first place award from the American Cheese Society in 2011. The chef’s creamery also makes the bloomy-rind, soft-ripened cheese called Shepherd’s Halo, a hard, aged, farmstead cheese called Cacio Pecora and the newest addition, a sheep's milk yogurt called Skyr. In addition to making cheese, Seidel raises a heritage pork breed called "Large Black" and has planted his 10-acre farm with fruits and vegetables to supply the restaurant kitchens. In fall of 2014 Seidel opened a third endeavor: Mercantile dining & provision, a restaurant and European style market located in Denver's Historic Union Station. With Mercantile, Seidel and his team further solidify the continuity and sustainable relationships between restaurant, farm and market.